*This post contains affiliate links. This means that if you click through and give the product a whirl, I get a tiny fee for spreading the news at no extra cost to you. Hello, I’m Reese and I’m recovering from a West Elm addiction. I don’t know what it is about that place, I swear they pump something in the air vents because the moment I walk in I become convinced that the answer to all my problems (i.e. taxes, being self-employed, existential angst in general) lies in gold rimmed fake geode coasters or $50 decorative giant twig balls. What do you even do with a giant twig ball? 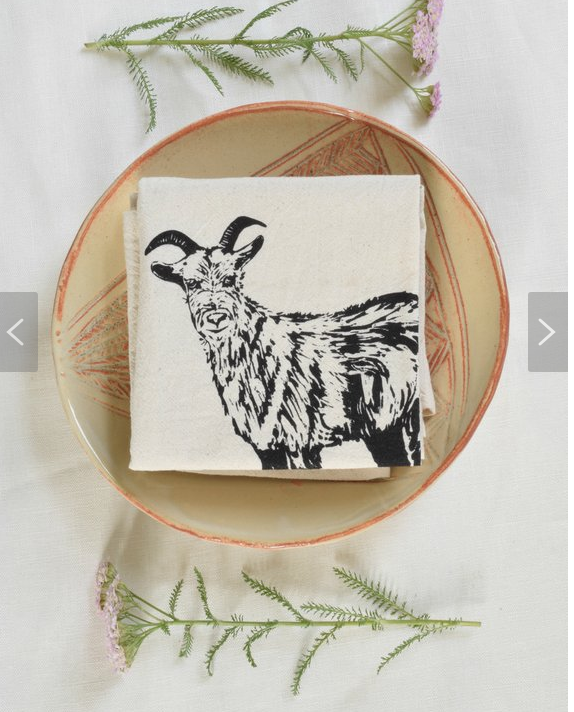 Anyhow, one of the hardest parts about trying to go zero waste and living a greener life has been, for me personally, giving up the occasional fun and frivolous home decor item. My nesting instincts are strong, y’all. So once I upcycled the needles off my tree I was 1) sick to death of Christmas trees and wanted to use up the rest of it in a hurry and 2) plotting how to upcycle my Christmas tree into a fun home decor item… a cheerful spring table runner! I’m thrilled with how it came out, it looks way better than any table runner made from an upcycled Christmas tree has any right to. I went with bright pink and blue beads because I am SO READY for spring and my original thought was that it would be really cool to upcycle your Christmas tree into your Easter tablescape, but it would probably look amazing with rose gold beads or other metallics for a more rustic meets glam feel. Before we jump straight into the DIY, a gentle reminder about why I’m upcycling a Christmas tree this year: 2019 is the year of viewing waste as opportunity rather than failure, so we’re going to be incorporating more creativity into the blog this year. And while you ABSOLUTELY can compost your tree, use it as firewood, or donate it, the entire argument of real versus fake Christmas trees is predicated on the assumption that your Christmas tree is going to be treated as a single use disposable item, when in reality it is a beautiful source of useful material. As always, I’d like to credit Salvage & Stitch for giving me the inspiration for this year’s foray into upcycling Christmas trees. Decide how long you’d like to make your table runner. (You could also easily make placemats.) I made a shorter one, about 40 inches, for my kitchen island table. Measure out 4 equal lengths of twine that are roughly 6 times longer than you’d like your table runner to be and cut your twine. Set aside. 2. Now for the most time consuming part: select and prepare your branches! The width of your table runner will likely depend on the size of the Christmas tree you’re trying to upcycle. My tree was on the smaller side, meaning I had less branches of the desired width and shape, so I went with a roughly 11-12 inch width for my table runner. Using your garden shears, clip off a large quantity of full branches from the trunk of your tree. 3. 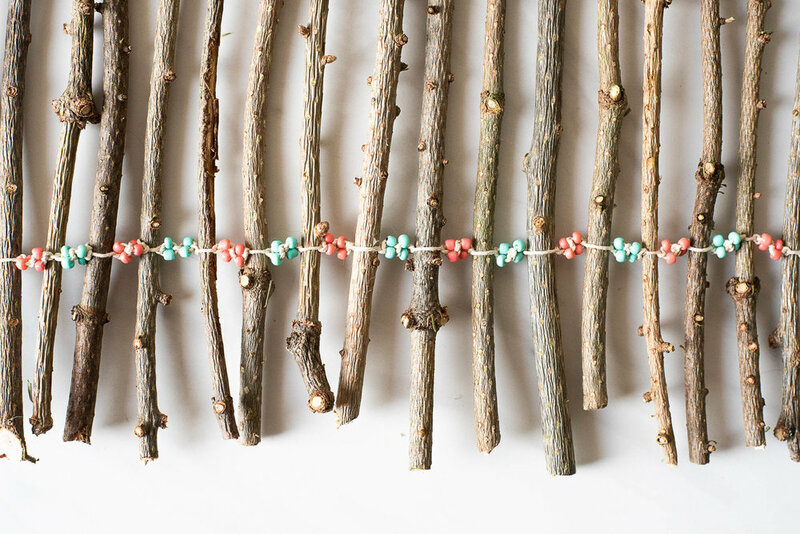 Then sort through your branches using your ruler, and select and clip the portions to use for your table runner. You’re looking for the straightest portions of branch that measure in the 10-12 inch range, but you’ll want to keep them about a quarter inch in diameter. Anything much thinner will become brittle and break as the wood continues to dry, and there’s not much point in a table runner you can’t put things on top of. I used about 55 branches in my table runner. 4. Switching over to your floral shears, clip off any forked offshoots from your branches and then remove your needles. They should come off relatively easily as your tree has been drying out throughout the holidays (and dropping needles all over your home), but I found it fastest to move along my branches with a pinching motion. You can upcycle your needles or compost them. 5. Wash your branches. As I mentioned in my How to Upcycle Your Christmas Tree into Non-toxic Vinegar-Based Cleaning Solution post, your tree is a real tree that lived outside and is covered in dirt and dust. You’ll probably experience this first hand as you remove the needles and branches. Place your branches in your small bucket or bowl, drizzle with dish soap, and add hot water. Agitate your branches and let soak for roughly 5 minutes. Agitate again and rinse until water runs clear. Let dry overnight. 6. Select your first twig and lay it flat. Take your first two lengths of twine, measure four inches from the ends, and tightly double knot. Repeat with your second pair of twine threads. 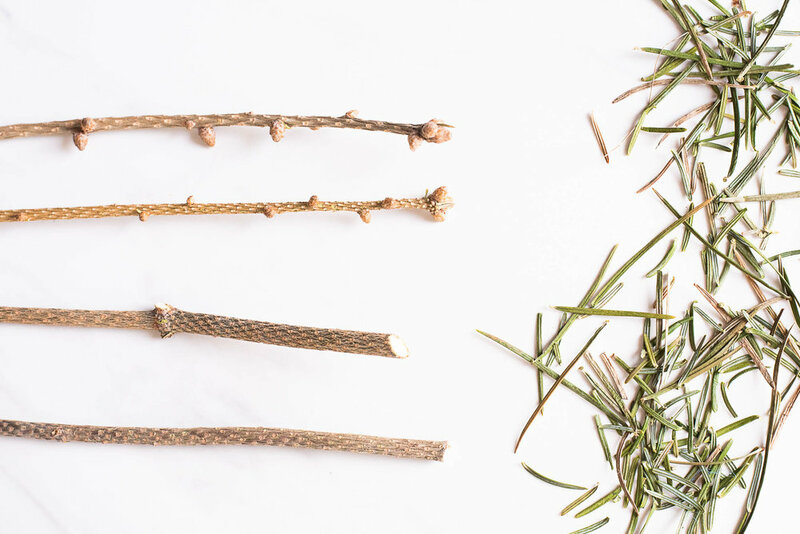 Nestle your twig inside both sets of twine with the knotted side serving as the end of your runner. 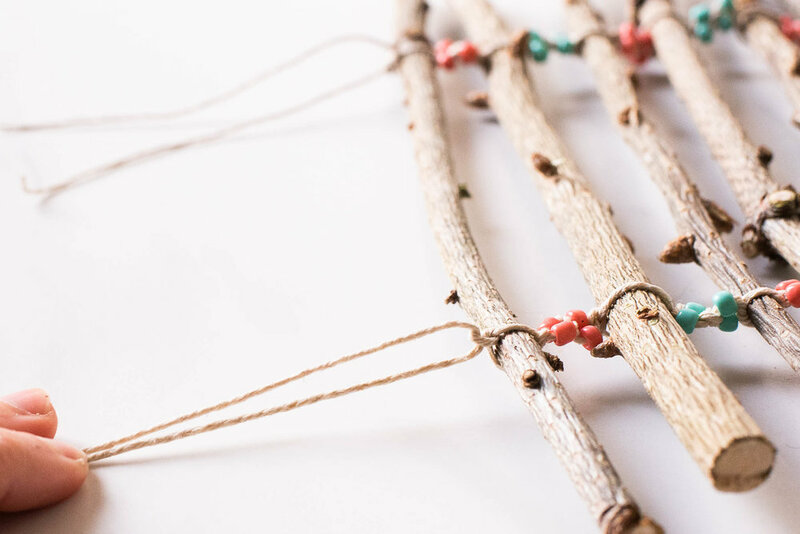 Position each knotted length of twine approximately two inches from the ends of your branch, these will be used to weave together all of your twigs. Using the long side of the twine, tightly tie two more double knots on side to anchor your twig. 7. Then thread 4 beads on your twine, one on each end. Push your beads flush to your double knots and add two more double knots. Repeat with 4 more beads, double knot, and anchor your next twig. 8. Repeat these steps, alternating bead colors if you’d like, until you’ve reached the desired length of your table runner. Tie off with two more double knots. And there you have it! You’ve now transformed your Christmas tree into an adorable table runner just begging for a dinner party. You’ve upcycled the majority of your Christmas tree, you’ve taken a creative step toward waste management, you’ve saved yourself $50, and you’ve made what could be the perfect focal point for your Easter dinner. Give yourself a pat on the back (or a glass of wine, whichever)! The best part? Whenever you’re tired of your table runner, simply snip through your twine, reserve your bead for your next project, and compost the rest! Remember to check out Fin & Stem, Compost and Cava’s storefront, on Etsy.